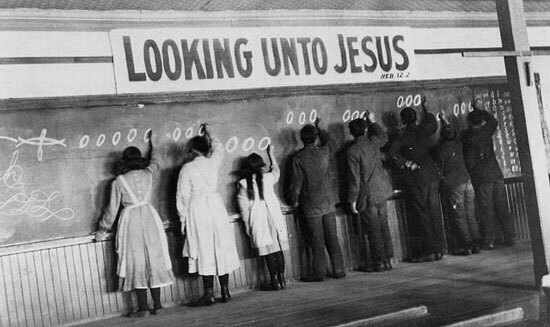 A group of Aboriginal students writing on a blackboard at a residential school. Residential schools were largely run by churches where students were students learned religion and were taught low-paying trades. These schools, for the most part, were run by churches and overseen by the federal government where the native language of many of these children was replaced with English or French while the various Native religious and spiritual beliefs were condemned and the students were taught to become Christians. School days in the residential system consisting of a half-day of studies and a half-day of trades-related activities; this included blacksmithing, carpentry, sewing, and many other similar activities. This was done with the expressed desire of having Aboriginals exit the school system without the skills required in order to enter into the knowledge based economy (Law, Business, Medicine, etc.) with a background in the trades many Aboriginals would be forced into the lower rungs of the economic ladder which was in conjunction with the federal government’s belief that Aboriginals were lesser people than whites and could not perform the same tasks. As David MacDonald and Graham Hudson demonstrate, poor conditions as well as physical and sexual abuse were rampant in the residential school system. Many students died as a result of diseases, such as tuberculosis, while thousands of others suffered from trauma as a result of their time in the residential school system. The legacy of the residential school system on the Aboriginal population is that it stole the culture, language, and economic independence from not only the thousands of children who attended these schools but from their future families and communities as well. By the 1960’s, most residential schools had closed and were being replaced with the practice of opening schools on reserves or allowing Aboriginal students to integrate with other Canadians in public, provincial schools. Since the National Indian Brotherhood’s 1972 position paper entitled Indian Control of Indian Education, which first identified its organizations desired role for education policy, the federal Department of Indians and Northern Development (DIAND), now Aboriginal and Northern Development Canada (AANDC), has slowly moved away from micro-managing band run schools and has passed the administrative duties on to the First Nations leaders in their respective communities.